Throughout KS3, pupils will be required to show good teamwork and commitment in their Drama lessons. The basic skills learned in Year 7, Term 1 are recapitulated and built on in subsequent terms and years. Throughout, pupils are encouraged to attend as many live theatre productions as they can, and to take part in live theatre. Homework: There is little Drama homework in term 1, although pupils may be asked to bring in items from home. How to help: Help your child with the right clothing for Drama lessons. Encourage your child to show and explain what he/she has learned. 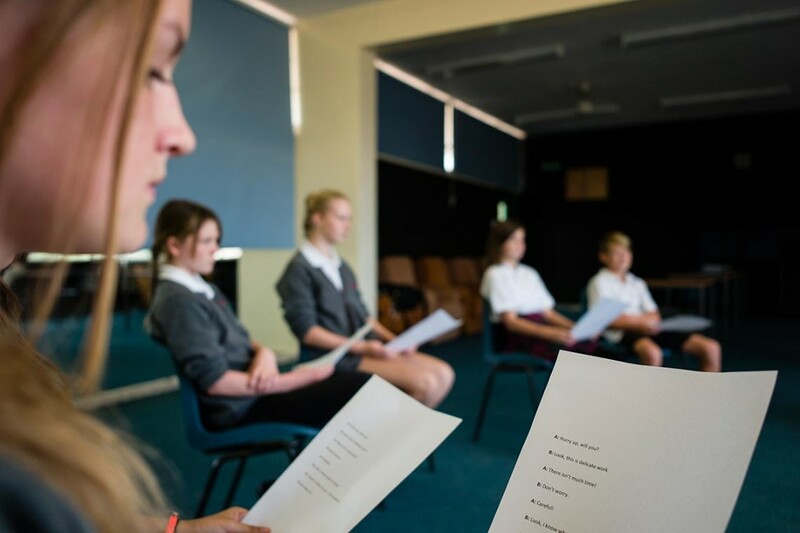 During this term, Year 7 pupils will work on turning a script into a performance. The skills learned in Term 1 will be reinforced and employed in Term 2. Techniques such as hot seating will be explored. Homework: Homework will consist of learning lines and writing up evaluations. How to help: You can help by listening to your child go over his/her lines. During this term, pupils will work on devising a script. This will include polishing improvisation and learning the conventions of scriptwriting. Homework: Homework will consist of writing up script and notes. How to help: By NOT contributing ideas! It is fatally easy for the pupils to think that “what mum and dad say” must be better than their own ideas. Instead, encourage your child to explain to you how their group is getting on. Homework: Homework will consist of writing up notes. How to help: A list of useful film clips will be issued; it will help if you can enable your child to watch these. Encourage your child to take part in the Station pantomime. Melodrama – Pupils will research the history of melodrama, and will write and perform their own. They will also produce a “Melodrama Manual”. Homework: Homework will consist largely of written work, and learning lines. How to help: Listen to your child as they learn their part. Children may also be asked to bring things in from home. Introduction to Shakespeare – Pupils will learn and perform a piece of Shakespeare. Techniques such as thought tracking and role-on-the-wall will be explored. Homework: Homework will consist of learning lines. There will also be a research component. How to help: As ever, with listening to your child as he/she learns lines, and by making research facilities available. Staging Romeo and Juliet– pupils will evaluate different productions, and will then work out their own. Homework: Homework will consist of writing up notes and undertaking research. How to help: Make research facilities available. Different forms of theatre – Pupils will research a theatrical form (e.g. musical theatre; theatre of the absurd; kitchen sink drama) and will then prepare and perform a short piece in their chosen form. Homework: Homework will consist largely of research and practice. How to help: Make research facilities available. Listen to your child’s lines. Devising a play from a given stimulus. This is an introduction to GCSE Drama.